Chops Percussion is excited to announce we will be able to serve our customers better than ever, adding Pro Audio to our offerings. Since last fall, we have been working with our manufacturers and distributors to find the most popular and best choices for pro audio, especially for the marching arts. We have added over 300 items to our website and continue to add more every week! More than just a few options, Chops is proud to offer a huge selection of digital/analog mixers, active/passive speakers, power amps, graphic equalizers, microphones, cables, and more! These items, along with detailed descriptions, can be found on our website. If you are interested in a pro audio quote for your program, please email sales@chopspercussion.com. Our experienced staff will be happy to help you find the best products for your program. 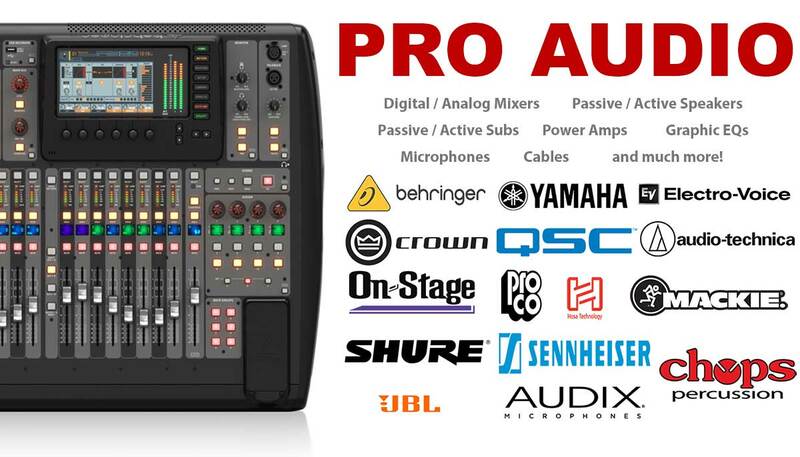 Q: Do you carry pro audio gear in stock? A: Chops is a non-stocking pro audio dealer, but that does not mean it will take long to get your gear! Chops has a great relationship with our manufacturers and distributors helping ensure quick and easy turnarounds for orders. (Subject to manufacture stocking.) Additionally, we do keep the most common cables and microphones in stock. Q: I don’t see the item I’m looking for on the website. Is this all you carry? A: Absolutely not! We are working diligently to add items to the website every week. If you do not see an item, please contact our staff and we will let you know if we can get your desired product! Q: I’m not sure what products would be best for my program. Is there a way I can get help deciding? A: OF COURSE! With over 40+ years of combined marching band and indoor teaching experience, our staff is ready to help you find the best product for your program and your budget. Q: What if I need help setting up my new sound system? Q: What is your return policy for Pro Audio? If you are dissatisfied with your purchase for any reason, items can be returned within 30 days of receipt of delivery, subject to conditions below. Chops Percussion reserves the right to refuse the return or to charge a minimum 15% restocking fee if the following conditions are not met. All returned items must be in new condition, in their original unaltered box. All package contents (including warranty information, manuals, and accessories) must be included. Chops Percussion can only refund the purchase price, shipping charges still may apply. Chops Percussion is proud and excited to be able to serve our customers more than ever. If you have any questions about product offerings, quotes, or pro audio in general, email us at sales@chopspercussion.comor call us at 317-813-2070. Don’t forget to follow us on social media for the latest products, sales, and exciting news!